My mother doesn’t care for scones, basic or otherwise. She thinks that they are too healthy tasting, and she’d much rather have pancakes or waffles or Dutch babies or crepes. I, on the other hand, love the warm craggly bits that stick out against the buttery, fluffy insides. Basically down for all the carbs for breakfast. Heh. But before my middle school cooking class (where I first made this recipe), I never made scones before. Probably due to Mom’s intolerance. I’ve made up for lost time, however. 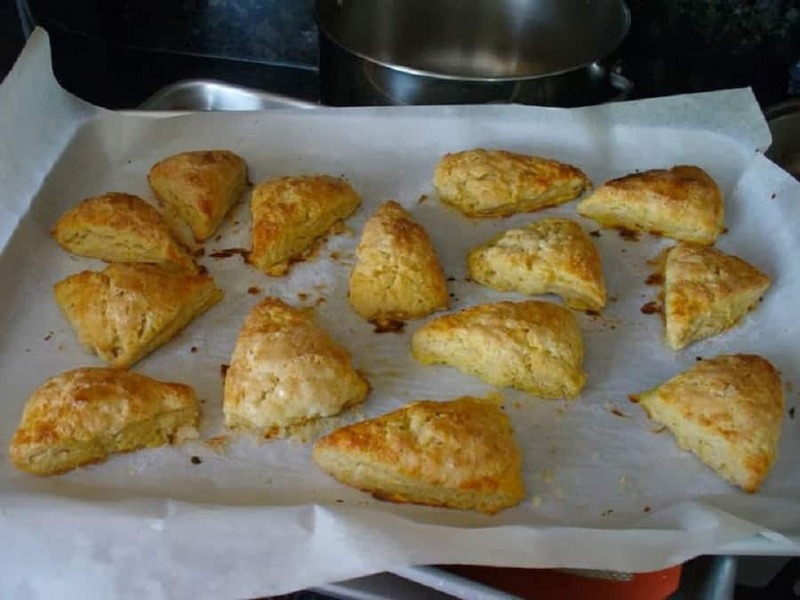 These basic scones have made many appearances at breakfast time, and I made a batch for my three-day Mount Whitney trip. They made a mornings a smidgen less terrible. I love how easy these are. I’ve got it down to where I can have scones in 30 minutes (if I’m awake enough while baking) from thought to eating. It’s also nice that no buttermilk or non-regular ingredient is needed, so I rarely have to go out to the store to get one of these ingredients. You can, however, make it fancy and add a sprinkling of lemon or orange zest, top the scones with cinnamon-sugar and sliced almonds before baking, or do whatever else your inner scone fiend desires. Plain is lovely as well, and you can eat them like the English have crumpets and tea: with butter and clotted cream (though I have no idea where you can get this) and jam or marmalade. Me? My favorite way to have scones is with a bare sprinkling of raw sugar, then split in half and spread with a copious amount of pulpy raspberry jam. Mmm. Mix the dry ingredients in a medium bowl. Cut in the butter; you can use a fork and knife, but I prefer using a pastry cutter. Combine 1 egg and the milk in a separate bowl; add to the dry ingredients and mix just until combined. Knead in the bowl just until it comes together. Divide in half and shape each into a ball. Place on a parchment-lined baking sheet. Roll each into a 6-inch circle and cut into 8 wedges. Beat the last egg, and brush onto the scones. If you want, you can sprinkle the tops with sugar (I like the crunch from raw sugar, but granulated is also tasty). Bake at 425F for 10 to 12 minutes or until golden brown.